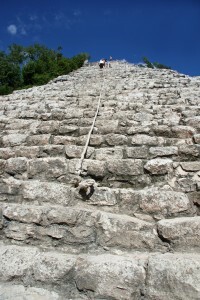 The historic Coba Ruins are located about 44 km northwest of the ancient mayan ruins of Tulum. Contrary to what many people believe, Coba has the largest pyramid of the many Mayan ruins located in the Yucatan Peninsula. 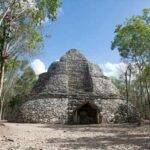 Our Coba tours from Playa Del Carmen offer a simple one day excursion to witness some of mankinds greatest achievements in the form of pyramids that have lasted the test of time. 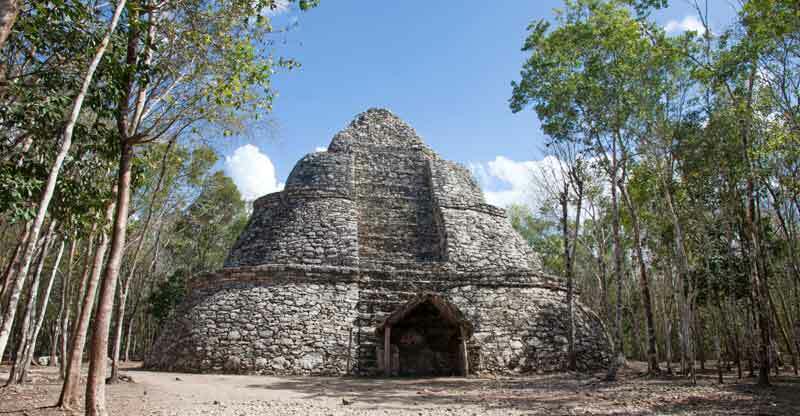 The construction of Coba is believed to have been started around 100 BC – 100 AD and continued right up until the time of the Spanish conquest of the Yucatan around 1550. To think of a civilization that had been building on a particular site for over 1000 years is pretty mind blowing. Talk about a commitment to ones work, this site had probably well over 25 generations of bloodlines working on the build. At the height of Coba´s reign of the Yucatan is estimated that there may have been in the upwards of 50,000 people living here. During your Coba tour from Playa Del Carmen you will have the opportunity to climb the tallest Mayan pyramid in the Yucatan referred to as Ixmoja which is in the Nohoch Mul group. Climbing this pyramid is a great privilege for a couple of reasons. One of the main reasons it is a privilege is because it is one of the last pyramids that the Mexican government allows tourists to climb. However, the reason we believe it is such a great privilege is because during the Mayan occupancy of this great city only the priests and holy men of the community were allowed this honor. These were holy temples used to get closer the Sun and the Mayan gods of their time. As of now you can still share this experience with the ancient holy men of it´s day. Once you reach the top you will have a view high above the tree line of the city, looking down on the entire site. 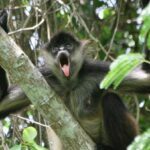 Most of the city is hidden in the thick jungle that lies below, but none the less, it is an amazing site to see. You are going to want to bring your camera for this one. In addition to the great structures you will see during your tour of Coba, you will also notice the vast areas that were once used as farmland. Agriculture was a major strong point for this city, and provided the ability for such a large population to live here during the ancient times. It is also believed that there was alot of trading taking place to the north and south of Coba as far south as Guatemala, Belize, and Honduras, and as far north as Chichen Itza. 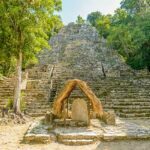 Coba however was only believed to trade with other Mayan communities, as well as hold a great influence in these other communities such as Tikal, Calakmul, and more. It is speculated that to maintain their influence there must have been military alliances between the tribes, and possibly arranged marriages of the elite to keep their close ties. Needless to say you will learn alot on your tour of Coba. Being such a short distance from Playa Del Carmen, and Cancun also makes this a perfect day trip to explore, and be back in time for supper. Also surrounding coba there are many cenotes that you may consider adding to your tour. 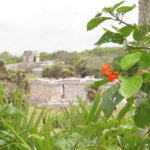 You will find Coba options on this website with cenotes, zip lines, and more. Also don´t forget, we offer the largest selection of Playa Del Carmen Tours at discount pricing so look around and make sure to do the ones that excite you the most. If you like the idea of the cenotes you may want to look at our Playa Del Carmen cenote tours section. Another section to consider is our Chichen Itza tours from Playa Del Carmen. If you have any questions about this or other tours feel free to contact us at any time, and we will see you in Mexico!